The diagonal crochet stitches that make up this intermediate cowl are so plush and cozy, they’ll definitely keep the cold air out and keep you warm and toasty. 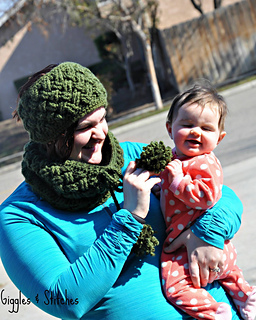 Plus, this cowl has a drawstring you can secure it even tighter around your neck. This crochet cowl is shown in a springy green, but any color or hue will bring out the lux crochet stitches, so choose your favorite color or choose something that will best go with your outerwear for a flawless look. The Celtic Weave Stitch can be very challenging. Photos and a video tutorial can be viewed HERE. © Copyright 2016 Prime Publishing, LLC. All rights reserved.